The Real Madrid skipper has a 100 per cent penalty record since taking over duties from Ronaldo, and that has prompted him to score more goals than he has ever scored in season. 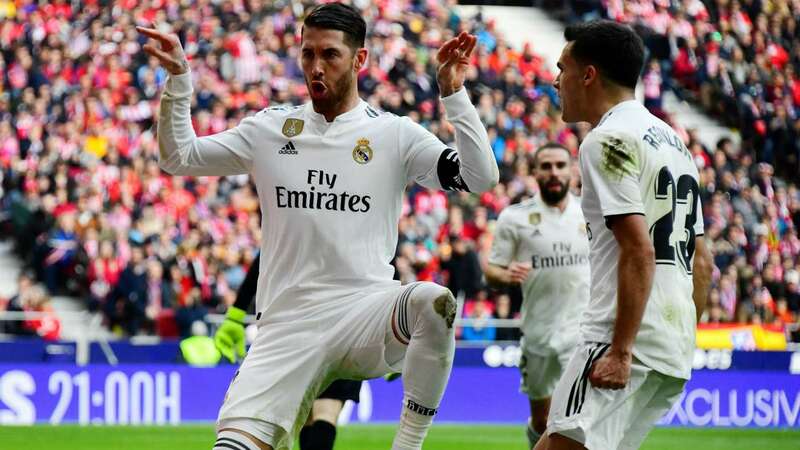 His goal proved Real Madrid's match-winner on as they took down fierce city rivals Atletico - and the defender set a new personal best in the process. Atletico know that better than anyone, having twice suffered the centre-back's ability in front of the net in none other than the Champions League final, where he scored in both Real victories in 2014 and 2016. Thanks to Cristiano Ronaldo's move to Juventus, Madrid's captain has this season taken on the extra responsibility of converting his side's penalties. And he was once more unerring from 12 yards out to beat Jan Oblak in Madrid's 3-1 victory at the Wanda Metropolitano. After seeing Antoine Griezmann cancel out Casemiro's opener with a fine finish through Thibaut Courtois' legs, Ramos was given the chance to shine when Vinicius Junior was taken down just inside the penalty area. Gareth Bale later came off the bench to put the result beyond doubt, after Atletico's Alvaro Morata saw an effort against his old club ruled out by VAR due to a marginal offside call. Sergio Ramos Atletico Madrid Real Madrid Ramos has now scored 11 goals this season, a tally which is his best ever in all competitions. Atletico, as mentioned above, have long been one of Ramos' favourite foes. The defender's first goal of the season came in August's UEFA Super Cup derby, another penalty, and he has now scored six against Diego Simeone's troops - only former club Sevilla have conceded more against him. Saturday's victory saw Madrid leapfrog Atletico into second place, five points behind leaders Barcelona.